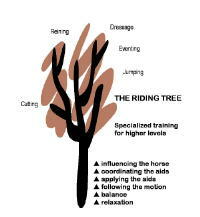 As we move up the riding tree, we learn to relax on the horse, stay balanced and follow the horse’s motion. As we continue to develop our ability to communicate more clearly with the horse, we learn to apply the pressures of weight (seat), leg, and rein aids to communicate to the horse the shape we would like him to take. When we first begin using these aids, we are aware of applying them one at a time. Then we mentally group them into “recipes” or “formulas” for particular shapes. We even illustrate these groups of aids as pictograms to help us remember which pressures create which shapes. Communicating to the horse involves much more than just a mechanical application of a specific set of aids. That’s the beginning but if riders want to progress up the riding tree from merely applying the aids to coordinating them, they have to do more that just use their aids in an “on” or “off” mode. Coordinating the aids means applying the right aids in the right sequence with the right degree of pressure and with the right timing. Developing a feel for this coordination requires some additional skills. First, riders need to be able to apply the correct aids without having to stop and think about exactly which ones to use in each situation. They have to develop muscle memory of the shape their body assumes which, in turn, creates the aid pressures that shape the horse if he correctly moves in the direction those pressures indicate. Their application of the aids has to go on autopilot. Second, riders need have to have an independent seat. They can’t be gripping with their legs or hanging onto the reins to keep their balance. They have to be aware of each of their individual body parts, each of their joints, and be able to use each one independently of the others. They need to be aware of where their body is in space, whether they are perfectly balanced over their horse or whether they have started leaning left or right or forward or back. Third, riders must learn to apply the aids with different degrees of pressure. They won’t be able to do this if they do not have an independent seat and body awareness. The degree of pressure may vary depending on the horse’s understanding of the aids, the horse’s willingness to pay attention to the aids at that particular moment in time, and the specific question that the rider is asking at the moment. Fourth, riders must learn to apply the aids at the correct time in the sequence of footfalls at various gaits to get the result they want. It’s easy to see what the horse’s front legs are doing but it takes time to develop a feel for what the horse’s hind legs are doing underneath you. In the beginning, the horse is the rider’s best teacher because when the rider asks, the horse always answers. The rider interprets the horse’s response and judges the effectiveness of his or her aids. For example, if the rider asks for a left lead canter and the horse just trots off faster, the rider needs to figure out what went wrong in the choice of aids, the sequencing of the aids, the degree of pressure or the timing. Then the rider tries once again to coordinate the aids correctly and, once more, interprets the feedback. Riders need to work on many different types of horses in order to develop the skills they need to coordinate their aids. If a rider doesn’t ask with sufficient precision, a forgiving Oldie Goldie may give them a canter in response to aids that would only confuse and fluster a young horse. Horses with different personalities will respond differently to varying degrees of pressure or accuracy. Each horse can teach the rider an important lesson. Working with someone on the ground who can describe what the horse’s feet are doing until you can accurately feel it with your seat can be helpful in developing a feel for timing. We also videotape our students regularly. Studying their tapes, they can critique the coordination of their aids and the results they are getting. As riders progress, it becomes critical for them to develop feel, interpret results, and judge the effectiveness of their communication with the horse. They have to do this while staying relaxed, in balance, and following the horse’s motion. Only then will they be capable of riding a horse in a way that influences and trains it. Just keep riding.